I try to install Windows Server 2016 Standard via a bootable usb key using Dell LifeCycle Controller, except that at the step that asks to insert the media I insert the USB I click next but it ' Displays an error -Media not found-. We have a Power Edge T330 13th Generation Commander recently. Can you boot to USB key if you use the boot menu? This will confirm the key is good. Did you ever figure this out? I'm having the same issue. I've tried a Bootable USB key formatted for UEFI (GPT and MBR), and a regular USB with an ISO file on it. I can boot to it fine through BIOS. I'm having the same issue. Tried two different USB drives on both the USB 2.0 and USB 3.0 ports on the front. Dell T130 latest LC firmware as of 8/18/2018. Would love to hear if anyone sorted this out. For those looking to update the life cycle controller from a USB stick, be sure to format with FAT32. Struggling a little bit with this myself. I'm on an R630, and moving away from GUI based to headless Core based hosts (Hyper-V/2016). Traditional install shows No active NICs available when Core is loaded. 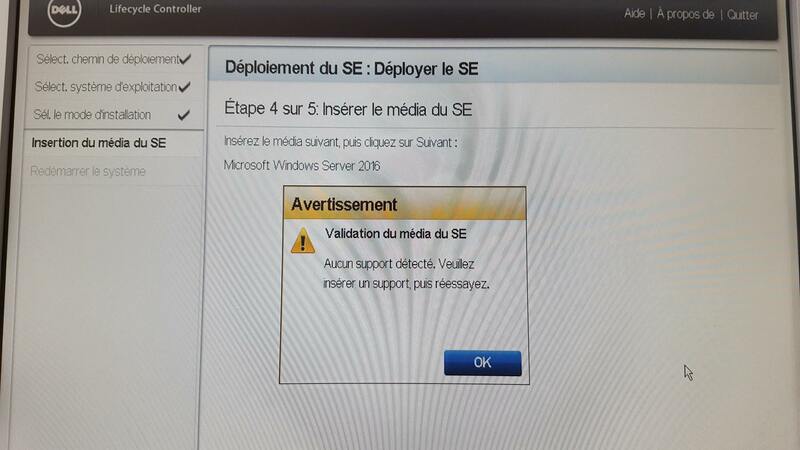 Running the Emulex driver installer fails to resolve this. I'm aware of procedures regarding using pnputil.exe to install the .inf files directly, but even an extraction of the drivers only provides an executable, no .inf files available. So then I looked at the OS Deployment option through Lifecycle controller. I've got my UEFI boot set to load drivers from a FAT32 memory stick. Successfully uploaded the latest 2016 driver pack. The next step is selecting the OS Media, and here I've hit a brick wall. FAT32 won't allow a 6GB ISO of course, so I've got another USB stick on NTFS with the ISO installer present. My understanding is that while UEFI doesn't allow booting from NTFS, it should still be able to work with it. It's not recognising the media, and I've now read a forum post stating that Lifecycle Controller will only recognise Retail ISOs, and not Volume License!? Bit of a major and undocumented limitation with that, so I feel I've wasted time with that option. So... can anyone tell me the most efficient way to install Server 2016 Core, with appropriate drivers loaded ?